Corfu, NY, January 12, 2019—It was a record setting night at Pembroke Jr./Sr. High School, as the community came out by the hundreds in support of the team’s eighth annual Shooting For A Cure! game. On Thursday, by game’s end, their eighth annual Shooting For A Cure! game had raised over $28,000 to help fund research efforts at Roswell Park. Throughout that evening and early into Friday morning, more donations continued to pour in bringing this year’s total to $30,020.19! To date, the team has raised over $119,000 for cancer research since the event’s inception. 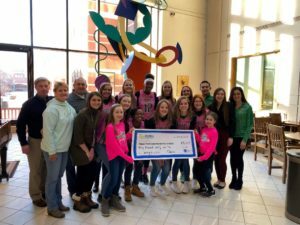 With this year’s donation, the Pembroke Girls Basketball team will now be recognized as the newest member of the “Leadership Circle” level of donors at Roswell Park, topping $100,000 in total funds raised. “This is really, really special! You talk about grass roots efforts. 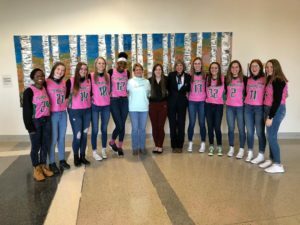 This is a special group of girls that are playing basketball and raising money for Roswell Park, to help us find a cure, for us to help patients,” Dr. Candace Johnson, President & CEO of Roswell Park stated. “It doesn’t get any better than that. It’s amazing! And it’s not just two dollars, it’s over $30,000, so it’s really significant,” Johnson shared. 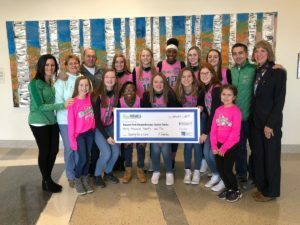 Coach Ron Funke and the Pembroke Girls Basketball team presented the full proceeds of their latest fundraiser to Team Roswell coordinator, Alex Hoaglund, in the hospital lobby on Friday. It’s a post-game tradition that Funke acknowledges has great meaning to the program. “These girls remain the driving force behind this fundraiser and it’s our basketball program’s identity. What started eight years ago in support of my wife’s diagnosis has continued to grow more and more each season. The girls realize how widespread this disease is and Shooting For A Cure! has a personal meaning to each of them. Sadly, cancer affects their friends, families, teachers, and neighbors. 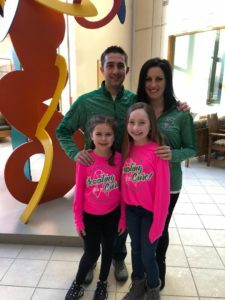 Being able to raise over $30,000 last night and this morning has demonstrated how committed our community is to supporting these girls in their mission,” Funke stated. “Being here at Roswell Park today to donate what we’ve raised this season is hard to put into words. As we walked in today, we were greeted by many people who are actually fighting their own battles against cancer. It’s a tangible reminder to this team that their efforts off the court are making an impact in the fight against cancer. My wife, Toni and I are both survivors, so this visit with the team becomes more meaningful every year,” shared Funke. 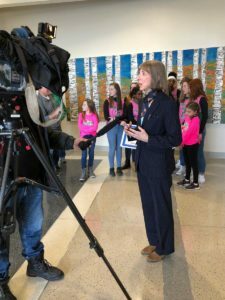 When the team arrived at Roswell Park on Friday they were graciously met by Dr. Candace Johnson, President & CEO of Roswell Park, in the hospital lobby. “We were all so humbled by the opportunity to meet with Dr. Johnson today,” Junior, Mackenna Johnson shared. “She told us how appreciative she was for all the time and effort we put into this year’s Shooting For A Cure! game and how these funds we raised are saving lives,” recalled Johnson. “It meant a lot to my teammates and I that she took the time to come thank each of us personally for what we did. That means so much,” said Johnson. “I don’t think that any of us truly realize the magnitude of what our community has been able to do in the fight against cancer. Raising over $30,000 is a lot of money for our small community. It’s overwhelming to think about,” Johnson shared. “I remember being young when my sister and her teammates started this game. To be a part of the team that broke the $100,000 mark is simply amazing. I’m just so proud to be member of this team and to share in this Shooting For A Cure! mission with our entire community,” said Johnson. Roswell Park had sanctioned the eighth annual Shooting For A Cure! 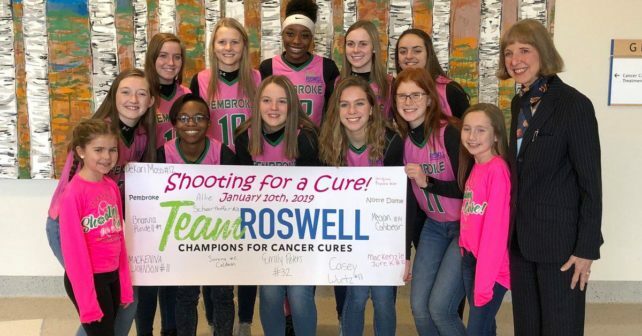 game as an official Team Roswell fundraiser and as a valuable example of the way that young people today can make a difference. 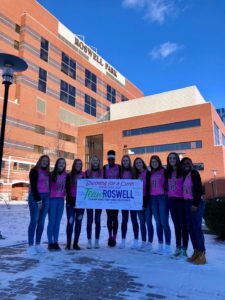 “It’s inspirational to have a group of teens who are so passionate about raising critically-needed funds for cancer research at Roswell Park. These girls continue to demonstrate an incredible amount of compassion,” said Alex Hoaglund, Team Roswell coordinator. “To think in one evening that this group of young women, with the support of Coach Ron Funke, Mike and Jen Wilson as well as their entire community, were able to raise over $30,000 last night is even more remarkable than we could have imagined!” Hoaglund added. “This small community continues to do big things. They continue to amaze us every year with this event. We’ve run out of words to describe how they do, what they do! To think that this small school district has raised over $119,000 in eight seasons is beyond extraordinary. Their commitment to this cause is inspiring,” shared Hoaglund. Following their check presentation at Roswell Park, the girls headed to Chef’s restaurant for their annual team dinner. “Reflecting on what this team has accomplished, in partnership with our community, is overwhelming to be honest,” Funke shared. “The Pembroke community rallied together with Notre Dame’s in the hopes of reaching our team’s $12,000 goal and we nearly tripled that! It’s truly inspiring. As a coach and proud Pembroke community member, I couldn’t be more impressed by what this year’s team has done. I also can’t say thank you enough to all of the local area businesses, community members, teachers, parents and student volunteers for making Shooting For A Cure! into this incredible fundraiser for cancer research,” Funke stated. After a delicious dinner at Chef’s, the team boarded their bus and headed back to Pembroke. Since Shooting For A Cure! began in 2011, it has raised over $119,000 and looks to continue its mission for seasons to come. The list of companies, vendors and individuals who donated to Shooting For A Cure! numbers more than 100 including, 26 Shirts, Alleghany Farm Services, Batavia Downs, Batavia’s Original Pizza, Buttercrumbs Bakery, Clarence Deli, Coca-Cola of Rochester, Crickler Vending, Darien Lake, Dave & Adam’s Card World, Delta Sonic, Dry Creek Group, Fenton’s Produce, Five Guys, Haun Welding, Hershey’s Ice Cream, Insty-Prints, Kay Jewelers, Kohorst Trucking, Linda’s Family Diner, Lorenzo Alexander, moondanceCat, Northtown Automotive, Original Pizza Logs, Pesci’s Pizza, Petals to Please, Pillar Real Estate Investors, Southwest Airlines, Tim Horton’s, Yancey’s Fancy, and the YMCA… just to name a few. ABOUT PEMBROKE HIGH SCHOOL GIRLS’ VARSITY BASKETBALL TEAM: The Pembroke High School Girls’ Varsity Basketball Team is comprised of 10 outstanding girls, ages 14 to 17. Their 2018-2019 captains are Mackenna Johnson, Casey Wurtz, and Emily Peters. They are coached by Ron Funke. Team colors are green and black and their nickname is Dragons. The team began Shooting For A Cure! as an annual event in 2011, and they are committed to the hard work and dedication it will take to win the battle against breast cancer. ABOUT ROSWELL PARK COMPREHENSIVE CANCER CENTER: RPCCC is among the first and only upstate New York facility to hold the National Cancer Institute designation of “comprehensive cancer center” and to serve as a member of the prestigious National Comprehensive Cancer Network. Many RPCCC faculty serve on the NCCN panels that create the Clinical Practice Guidelines in Oncology™ — the internationally recognized standards for clinical policy in oncology, and the most comprehensive, most frequently updated clinical practice guidelines available in any area of medicine. The RPCCC campus spans 25 acres in downtown Buffalo and consists of 15 buildings with about 1.6 million square feet of space. A new hospital building, completed in 1998, houses a comprehensive diagnostic and treatment center. In addition, the Institute built a new medical research complex and renovated existing education and research space to support its future growth and expansion. www.roswellpark.org.